Our Smart Zero Range was inspired by our Danish distributor and is formulated using the highest quality ingredients to support work, performance and condition, with minimal starch and sugar levels. As the name would suggest, our Smart Zero feeds have Zero Molasses and Zero whole cereals to help achieve this aim. Designed to provide quality nutrition to horses and ponies with metabolic / endocrinal conditions, or those at risk from gastric ulcers, the low sugar and starch formulations in Smart Zero provide the levels of energy and supporting micronutrients required for performance and to maintain or gain weight and condition. Castle Smart Zero feeds are extremely versatile and provide a healthier option for all active horses and ponies, including competition, sport horses, and veterans. 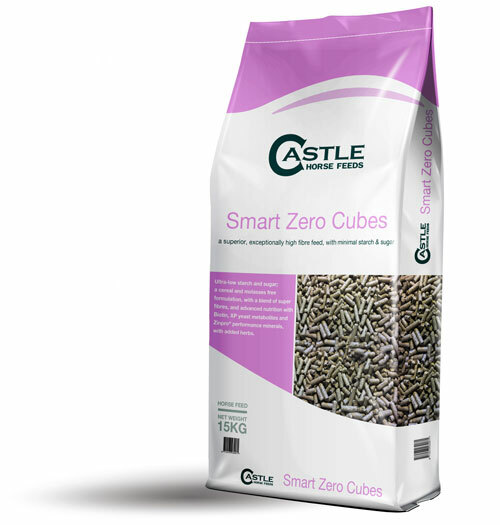 Smart Zero Cubes – a superior, exceptionally high fibre cube delivering advanced nutrition with very low starch and sugar levels. Smart Zero Cubes are suitable for laminitics, horses and ponies with Equine Metabolic Syndrome (EMS), Insulin Dysregulation, PPID (cushing’s disease), ulcer prone horses and ponies, veterans, and all horses and ponies needing a low starch and sugar diet with sufficient energy to support condition and performance. Soya Hulls, Grass Pellets, Full Fat Linseed Meal, Unmolassed Sugar-Beet Pulp, Full fat soya meal, Vitamins and Minerals, Vegetable Oil, XPC Yeast, Fenugreek, Oregano, Sage, Garlic, Mint, Parsley, Marjoram, Peppermint. Feeding Rate: 200-600 gm per 100Kg of horse’s weight, depending on condition and work done.